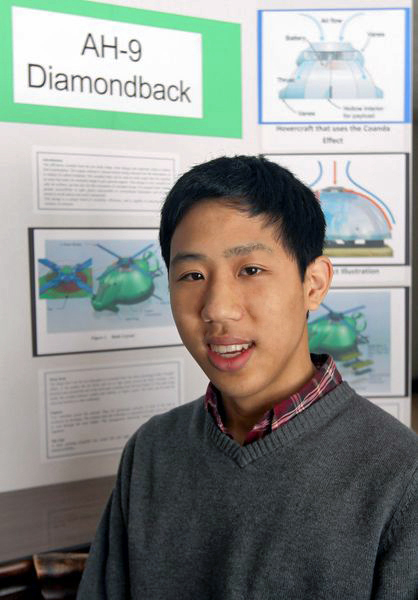 South Bend Tribune/GREG SWIERCZ Ethan Chu, 16, a home-schooled South Bend resident, describes his helicopter design that has won him the Igor Sikorsky Youth Innovator Award. While many teens went on vacation and relaxed on a sunny beach last summer, homeschooler Ethan Chu was hard at work designing a helicopter. And his research and hard work paid off. Sikorsky Aircraft Corp., and By Kids For Kids, an organization that inspires kids to become successful inventors, awarded Indiana teenager, Ethan Chu, the Igor Sikorsky Youth Innovator Award for his conceptual design of a circular-shaped medical evacuation helicopter. “I really like researching military stuff and reading about new technology,” Ethan told theSouth Bend Tribune. Son of William and Joann Chu, Ethan has been homeschooled all his life. As an 11th grader, Ethan likes to play football and paintball. It has been a lifelong passion of Ethan’s to draw airplanes and learn about aviation. He is a member of the Eta Sigma Alpha National Home School Honor Society. 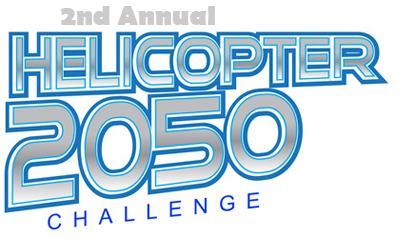 The Igor Sikorsky Youth Innovator Award is the grand prize for the Sikorsky Helicopter 2050 Challenge, a national competition started in 2011 sponsored by Sikorsky Aircraft and By Kids For Kids. This year’s program challenged youths ages 9-16 across the U.S. to envision an environmentally friendly helicopter. The competition rated designs for concept uniqueness, description detail and creativity of the presentation. The competition inspired teens to create original and environmentally efficient designs. Ethan portrays his winning design as a compact, circular-shaped twin-engine helicopter dubbed the AH-9 Diamondback (www.helicopter2050.com). ‘”AH” is short for “Attack Helicopter” and “9” because it was the ninth variant I designed. Diamondback comes from the fact the vehicle has a diamond-like shape when looking from above”, Ethan explained. High strength materials in the form of lightweight carbon nanotubes covered with titanium panels comprise the helicopter’s structure, a design approach that reduces the aircraft’s weight and fuel consumption, and improves its carrying capacity. “The nanotubes would make it 10 times lighter and much stronger than steel,” Ethan said. His environmentally friendly design further reduces carbon footprint by channeling engine exhaust along the rotor blades and around the body of the aircraft to provide a cushion of gas for additional lift — an aerodynamic principle known as the Coanda Effect. (left) Sikorsky’s Vern Van Fleet (Chief Test Engineer) and Judy Bankowski (VP and Chief Information Officer) with Norm Goldstein (By Kids For Kids Chairman) award Ethan Chu the $1,000 grand prize for his helicopter design. Furthermore, Ethan’s design doesn’t feature a tail (which is a standard feature on helicopters to prevent the body from spinning around because of the rotor). “Simply because the design features a counter rotating fan, a tail wouldn’t be needed,” Ethan commented. “Differing versions of the design could be used for military attacks, transporting materials or a medical version to transport up to two front-line soldiers out of a battle zone,” he said. Museums throughout the country participated in the Sikorsky Helicopter 2050 Challenge program, which engaged young visitors to envision the environmental future of helicopters while learning important scientific and engineering principles through fun hands-on activities. Ethan Chu, 16, toured the BLACK HAWK helicopter production line Dec. 13 with Sikorsky Chief Test Engineer Vern Van Fleet. More than 300 youths participated in the competition this year, this being only the second year the competition was held. After submitting his design in September, Ethan was notified later in the fall that he was the top winner. Just like any other teen, Ethan “was kind of surprised”. The effect that he won “didn’t really sink in” until later, Ethan explained. Ethan received a trophy and a $1,000 scholarship check during a company-paid visit to Sikorsky’s headquarters in Stratford, Connecticut. Accompanied by his father William Chu, Ethan toured the assembly line of Sikorsky’s iconic BLACK HAWK and SEAHAWK® military helicopters, and met with company rotorcraft designers and engineers. When he is older, Ethan aspires to be an aerospace engineer, and would like “to learn to fly aircraft”.